The subgroup that I worked in focused on nitrogen vacancy (NV) centers, which are point defects in diamonds that form when a single carbon atom in the lattice is replaced by a nitrogen atom, usually by bombarding the diamond with a high-energy beam of nitrogen ions. 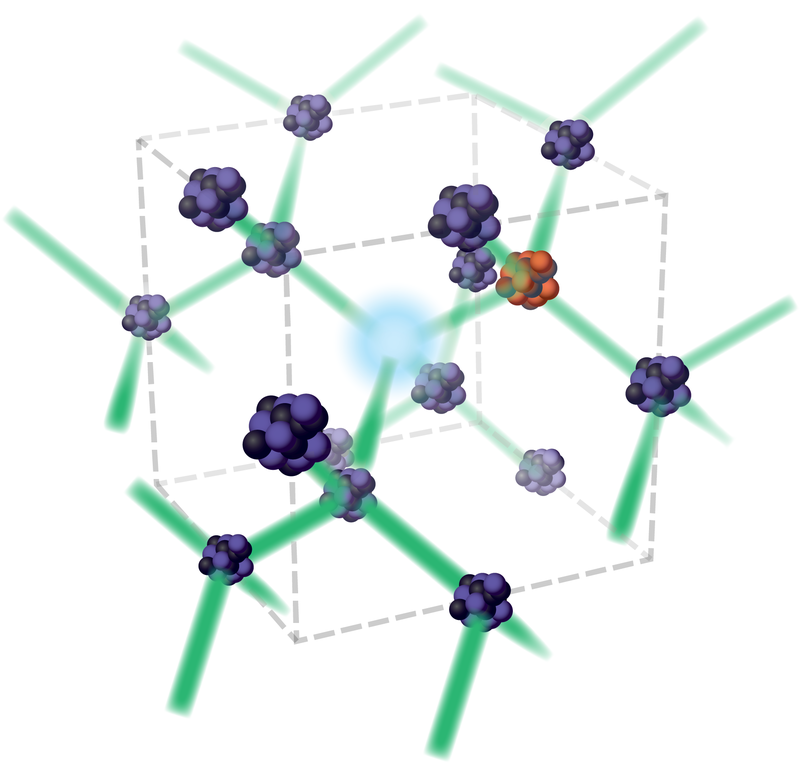 If the diamond is then annealed (heated up to a temperature below its melting point, but still sufficiently high that individual atoms can migrate through the lattice), the now-mobile nitrogen atoms will tend to seek out positions in the lattice that are adjacent to gap defects, or locations in the lattice where carbon atoms are missing. The intuition behind this behavior is that nitrogen, unlike carbon, prefers to form three bonds (it has a lone pair of two electrons that usually don’t form bonds). These lone electrons prefer to spread out due to their mutual repulsions, and so it is energetically favorable for the nitrogen to sit next to a vacancy in the lattice, where there will be less electromagnetic repulsion due to electrons in neighboring carbon atoms. The resulting two-point imperfection in the diamond, consisting of a nitrogen atom an an adjacent vacancy, is a very unique quantum system that many groups worldwide are now exploring for applications ranging from quantum computing to magnetometry. A nitrogen vacancy center embedded in a diamond unit cell. The reason that NV centers are so exciting is that they act like fluorophores—you can shine a green laser onto them, and they will re-fluoresce red light. This means that incident light and absorbed light can be easily separated using color filters, making them immediately useful in many applications where synthetic quantum dots are used for similar effect. But a further advantage of NV centers is that they natively have two possible ground states for their electrons, but when there is a magnetic field present the these two states “split” and one becomes more energetically favorable than the other. When an electron excited by green laser light relaxes into the now-less-likely ground state, it tends not to emit a red photon due to other mechanisms that spirit the energy away instead. The net result of this unique quantum structure is that the relative intensity of red florescence from an NV center can be used to infer the magnitude (and even direction) of local magnetic fields. All-optical measurement of magnetic fields using NV centers is currently being explored for biological applications (in which an electronic magnetometer would be too bulky or imprecise), but many groups are also exploring the use of NV centers for quantum computing applications, in which time-varying magnetic fields are used to flip a “bit” represented by the two possible ground states of the NV center, and the intensity of fluorescence from the NV center is used to read and write the state of the bit. The energy level diagram of a nitrogen vacancy center. Yellow indicates non-radiative transitions. The wires shown here are usually built on diamonds that are known to contain a relatively high density of NV centers, so that it is very likely that each wire will contain at least one center. 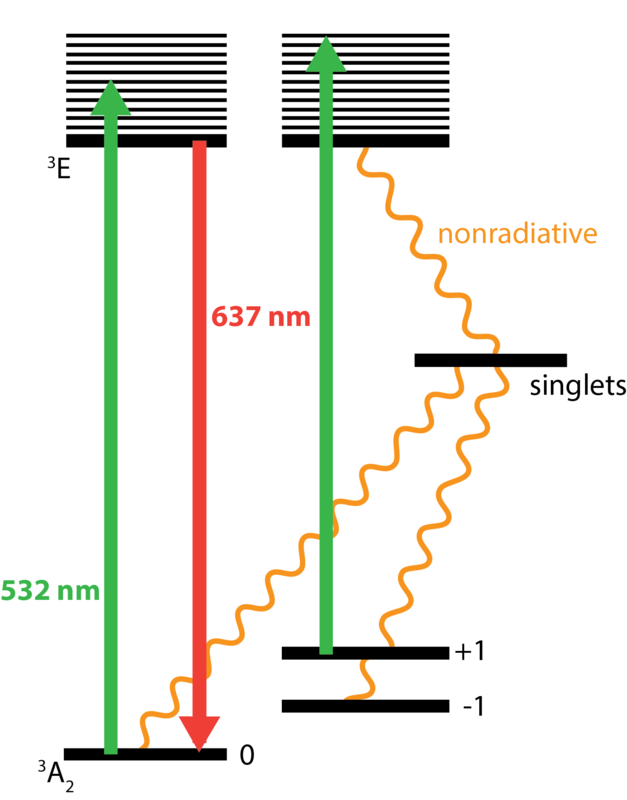 The wires essentially act as fiber optic cables: because the red light emitted by the NV centers can be emitted in several possible directions, but the optical setup used to measure fluorescence can only detect emission in one direction, the cylindrical wires are essentially used to channel the emitted light towards the top face of the wire, which is where the detection optics are then focused. The eventual goal of this research would be to use arrays of these wires to map magnetic fields of small objects like cells, allowing spatial resolution of magnetic fields in addition to precision measurement. Posted on 12/15/2013 by gammacephei. This entry was posted in General Physics, Uncategorized. Bookmark the permalink.